All AUPBA approved paintball fields hold players’ safety as their utmost priority and accordingly will issue you with purpose-built equipment. 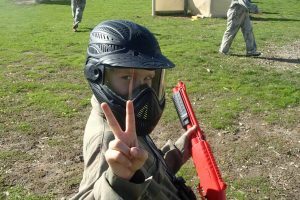 Although our approved centres stock very impressive safety equipment, including full length overalls, body armour and battle packs, it’s the paintball gun that people are most excited about. The particular paintball gun may vary between paintball centres but will generally be a semi-automatic and velocity-tested to adhere to safety regulations. 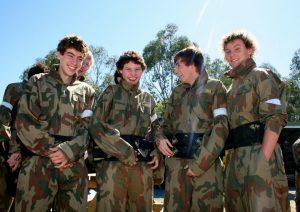 The most commonly used paintball gun in Australia is the Tippman 98 or the more superior Inferno Mk II. Some paintball centres offer marker upgrades for those players wanting an added advantage over their opponents. The propellant that allows the paintball gun to fire the paintballs is a bottle of either CO2 gas or compressed air, which field staff will attach to the gun before issuing to players. Recently, compressed air has become the most commonly used propellant. CO2 can be subject to changes in outside air temperatures whereas compressed air provides a more consistent and stable pressure, making this the more reliable option. It is also more environmentally friendly. All guns will be maintained by the paintball centres team of gunsmiths who will ensure the paintball gun is at optimum performance for your paintball adventure. The paintball gun, or marker as it is also known, will provide you with serious accuracy and firepower. The lightweight design and fast-firing action will ensure you have a fun and enjoyable, yet action-packed paintball experience. Click here to view other paintball equipment.